Celebrate Spring with this easy to create ideas for a Spring Easter Tablescape. Your friends and family will hop right over to your table with this simple but fun table setting. 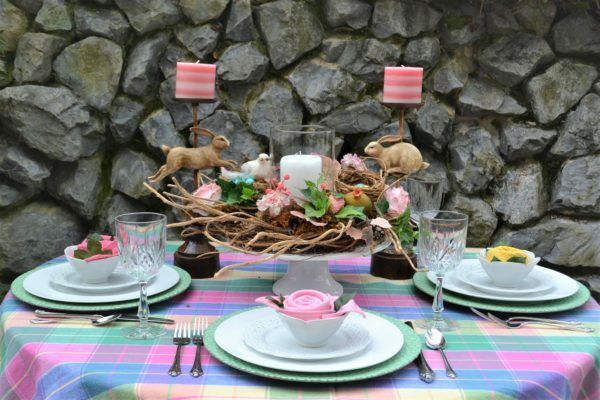 Soft shades of pink, lavender, green and yellow in the plaid tablecloth sets the foundation for this table. 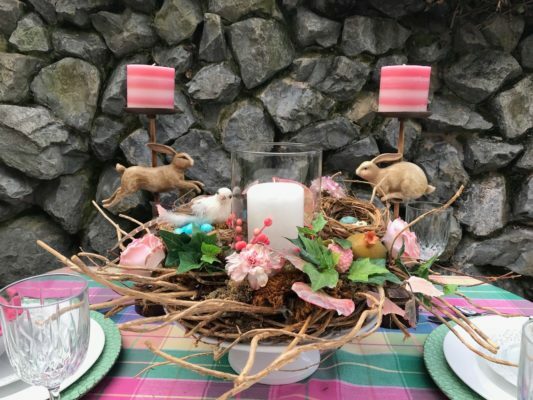 Two bunny candlesticks with pink and white candles help set the bird nest and floral wreath as the centerpiece. At each place sitting a rose napkin fold blooms from a small white bowl. 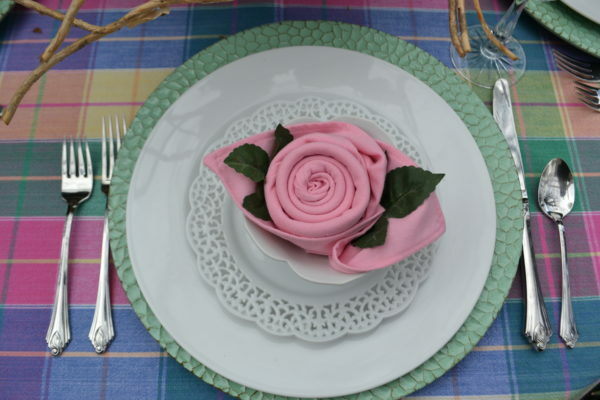 To see how to make the napkin fold and centerpiece click here. Here’s a few tips for making this table scape work for You! When selecting a plaid or textured tablecloth it is best to us solid dinnerware so it doesn’t compete with the background. Think about coordinating colors that are in the background table cloth that you could use for accents on the table, via the napkin and centerpiece. Create a fun napkin fold that goes with the overall theme of the table, in our case it is spring, bunnies and birds, so what comes to mind in the spring besides those items? Flowers. Early Spring roses. Add texture to the center of table and at each place setting with crackled charger and twig wreath centerpiece. The Centerpiece is the center focus of the table so think about the colors and theme of the piece to make sure it flows with the background table cloth and other accessories. Elevate the centerpiece to help balance the very tall candlesticks, being mindful not to make it too high so guests can see each other while setting at the table. Have Fun creating your tables. It doesn’t have to be too crowded or busy with a lot of dinnerware , keep it simple and clean so your guests will not be overwhelmed with “too much to look at”. Besides there will be food on those plates which also needs to be simple and light…like the pretty table. Plan a menu that coordinates with the tablescape. 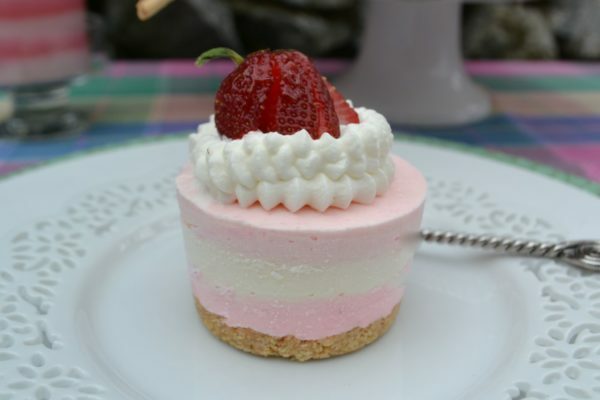 For this garden luncheon, consider, a mixed green salad with grilled chicken ,soft dinner rolls, maybe a bowl of White Gazpacho Soup and for dessert a striped No-Bake Mini Cheesecake where the stripes in the cake coordinate the stripes in the candles on the bunny candlesticks. Want to see more great ideas? Here is a link for Easter Party Ideas created by Proflowers.com. You will love these ideas and while you are there, think about a bouquet for your Spring Centerpiece. Other helpful links for “Getting the look”. Easter Wreath- Not the wreath used in photos but good substitute. Candlesticks– Not the bunny candlesticks but pretty tall glass globes. Tablecloth– Not the tablecloth in photo but good substitute.